There seem to be a couple of schools of thought on local lawns: to have one or not to have one? Some would say they're not environmentally friendly because of the high water demands on the commonly seeded perennial ryegrasses (Lolium perenne) to keep them looking good. When well-watered and biannually fertilized, you're rewarded with lush, verdant grass that's great for toe-dipping on sunny, 75-degree days. But are lawns a good choice in a time of increased water-consciousness and with the availability of less-thirsty lawn alternatives? Is there such a thing as an environmentally-friendly lawn? I say yes. With lawns, you can have it both ways! But it's not going to be seeded primarily with ryegrass, and it's not going to be thatched and full of weeds. If you've got thirsty grass growing on a slow-draining soil, and you're not committed to summer watering, your lawn probably looks like ours, yellow and patchy where the moss is drying out in the summer heat. It's time for a renovation. And here are our options. Water drainage in backyards is a common problem, especially in rainy climates like the Northwest. If your soil content is high in compacted clay particles, as is common in many areas of Portland, then your lawn likely suffers from excess water that literally has nowhere to go. 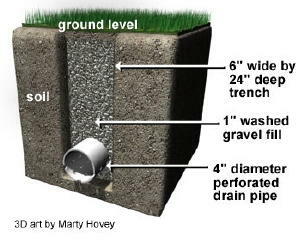 A "french drain" is essentially a trench that gets dug along the most common route where the water is getting backed up. A pipe is laid down under the ground so the water can freely flow out of your yard and into the street or sewer system. If your drainage problems aren't significant enough to require a french drain, you are lucky! The following method of renovation is much easier, and should suit your needs. Two local experts make the case for covering your lawn with a 1/4" - 1/2" thick layer of commercially available (not home composted) compost product, seeded with your lawn mix of preference, then top-dressed with 1/4"-minus crushed rock. Portland Water Bureau's Sarah Santner on a local garden show, offering the same solid advice. Wishing you a successful renovation!